CHILL THIS WINTER WITH THE GALAXY’S GREATEST COMIC! 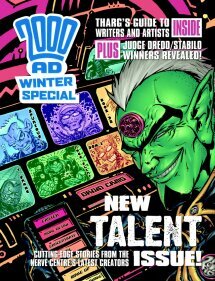 The 2000 AD Winter Special, published Wednesday 2 November 2005 priced £2.99, is a 64 page collection of stories focusing on new writers and artists. The Winter Special also includes two Judge Dredd stories written by John Wagner and illustrated by the winners in the Stabilo 'Design a Judge Dredd Villain' competition, as well as an all-new Rogue Trooper story by Gordon Rennie and Richard Elson, plus much, much more! To qualify for these prices, and to receive your copy on or before publication day, my Droids must have your order back by Wednesday October 26th (Nov 2nd for overseas subscribers). Whether you are a monthly or an annual subscriber, don’t delay – take advantage of this zarjaz offer today! Click HERE and reserve your copy. You’ll need your subscription number. It’s the number immediately above your name on the mailing label. Non Subscribers will find the Winter Special on sale at their usual supplier on Nov 2nd.